Beneath the dirt of fallen worlds lie the bones of forgotten empires and the relics of peoples now vanished into legend. Countless wonders lie silent, awaiting the hands of starfaring adventurers and the curiosity of fearless investigators. What glorious citadels and eldritch marvels remain undiscovered by humanity in the present age, and what miracles lie in the silent tombs of ancient alien kings? 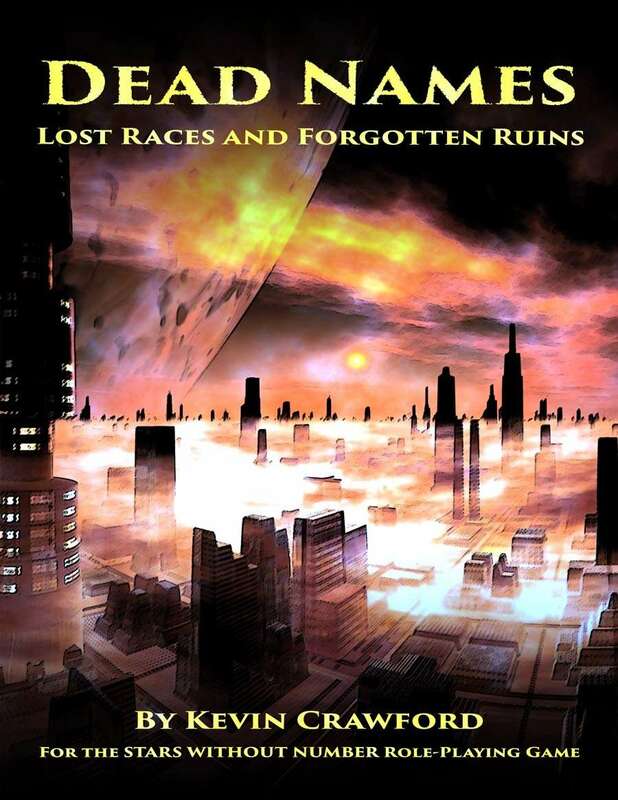 Dead Names provides a Stars Without Number GM with the tools to build these lost races and their magnificent works. With the resources in this book, GMs can quickly and easily fabricate the strange denizens of a former age and flesh out ruins and fortresses with the details they need to make for exciting play. The stress of constantly creating fresh content can wear down the most diligent GM, and Dead Names helps ease that strain with a polished set of tools. Tools for creating intriguing and alien denizens of the distant past and decayed present. Transhumans, synthetics, extraterrestrials, and metadimensionals are all given unique traits and qualities to make life easier for a GM in need of strange antagonists or potential allies. A framework for quickly and easily designing ruins and ancient edifices for your players to explore, helping a GM to create a steady supply of mystery and excitement to whet the adventurous impulses of heroic explorers. Guidelines for creating new relics and artifacts to beguile and baffle your players, with tools for fabricating everything from one-shot devices to eldritch artifacts and their inexplicable functions. Twenty new single-use devices are included as examples, along with another twenty freshly-made artifacts to stock your ruins. Would this be of any use to a GM running other dust? How suitable would this be for (or adaptable to) to a fantasy game that has roots in science-fantasy; for example, a lost colony world that regressed to a medieval level and where science is thought of as magic? What size is this printed, A5 or A4? Belated as this reply is, it's printed US Letter- 8.5 x 11. As of right now, I publish everything letter-sized as my page designs often require a great deal of room to breathe.